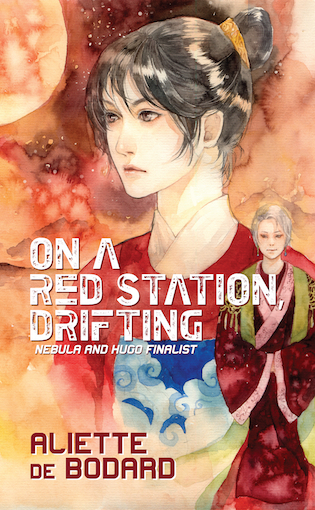 A novella set in the Hugo-award nominated series The Universe of Xuya: On a Red Station, Drifting. On the Locus Recommended Reading List for 2012; and a finalist for the Hugo, Nebula and Locus Awards for Best Novella. This was out in a limited hardback edition from Immersion Press in the UK, which is sadly out of print. I’ve put out an ebook edition, which you can get from most major ebook retailers. There is also a print on demand edition, available through Createspace. Authors’ notes, notably geeking out on the Chinese classic Dream of Red Mansions, here. If you’re interested, there’s a loose sequel forthcoming in the Oct/Nov 2015 issue of Asimov’s, set in the Dai Viet Imperial Court, and which has a cameo by Linh. More info (including a rough cover copy) here.